Despite a build-up of posts that I have promised and have yet to deliver, I will be going dark for a few weeks on this site. I’ve been writing up a storm this season, and have not really had all that much time to think! After Lakeside, Tommy and I decided (actually, he decided and I just listened) that going dark for a little while was a good idea. I’ll be doing no structured training for the next little while, and as such I likely won’t be doing much structured writing either. Time for some much needed time to recharge and take care of some things I neglected all summer. First to come will be a 2014 Season in Review post, likely after Tommy and I have had a chance to talk and define a focus for 2015. I received a new pair of Skechers to go with the pair of flats I raced Lakeside in, and I would like to do a review on those this fall. Of course, I’ll need to log some miles in them to do that! And I haven’t forgot about my recovery series. I kept putting it off because I kept learning lessons as the latter portion of my season went on. This downtime will allow me to do some research as well, and present a comprehensive and informed series. In the meantime, I will be keeping myself occupied adjusting to a new work schedule (boo) and building myself a new-to-me road bike (yay!). Last week I said goodbye to my faithful Kona Jake the Snake cyclocross bike, which despite being awesome, I did not ride nearly enough. I have always wanted to learn the inner workings of the tool that I spend so much time on (the bicycle), and what better way of doing so than building a road bike up? I sourced a snazzy Klein Q Carbon Team road frame from Pinkbike, and received a new 11 speed Shimano 105 5800 groupset just yesterday. I’m still waiting for a few tools and an 11 speed upgrade kit for my Williams S30 wheels before I can get started! 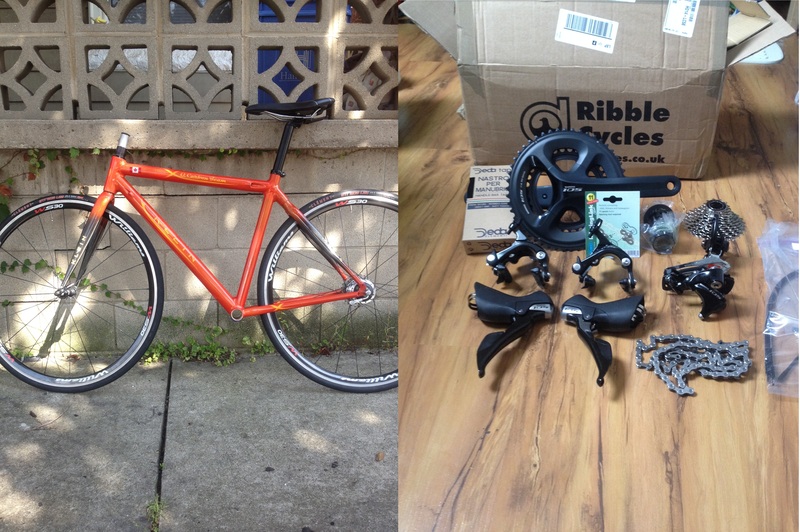 You can follow my slow and halting progress on Twitter, by following the hashtag #jbsfirstbikebuild. 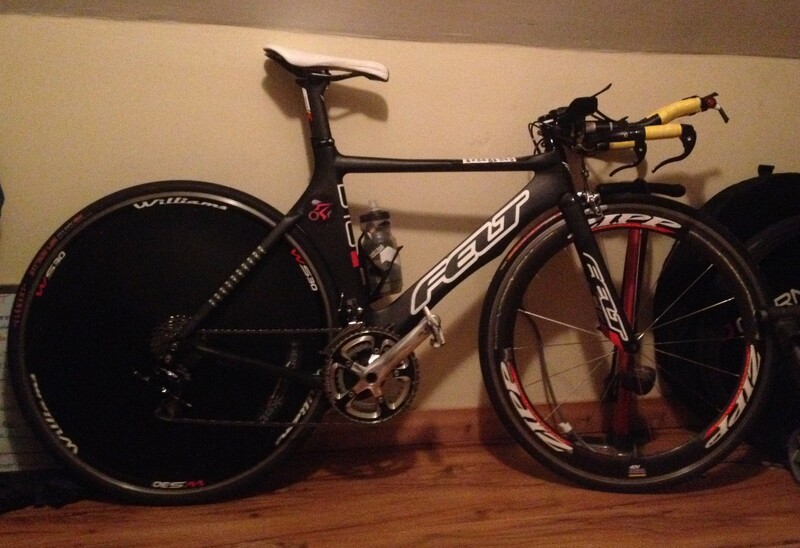 Well on my way to a wicked road bike! And the best part is…it will be 100% mine! 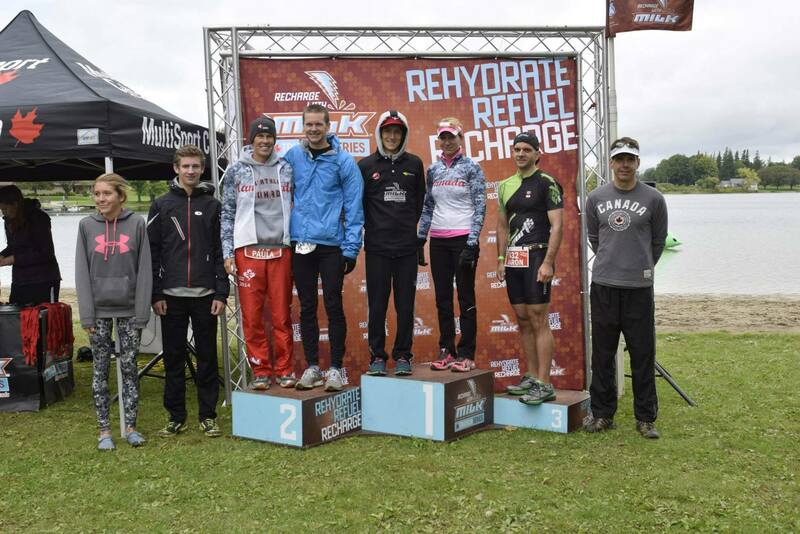 This past weekend was a big one for duathletes in Ontario, and I was fortunately able to be a part of the entire Multisport Canada Lakeside Weekend. 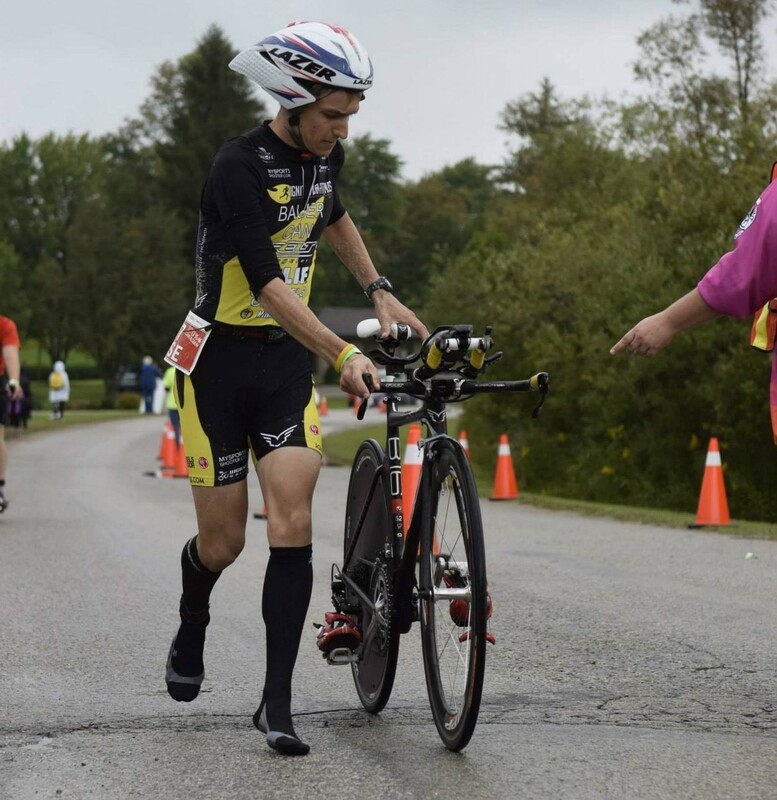 Saturday was for the sprint duathlon (results here), which I participated in, and then Sunday was the Ontario International Distance Duathlon Championships. 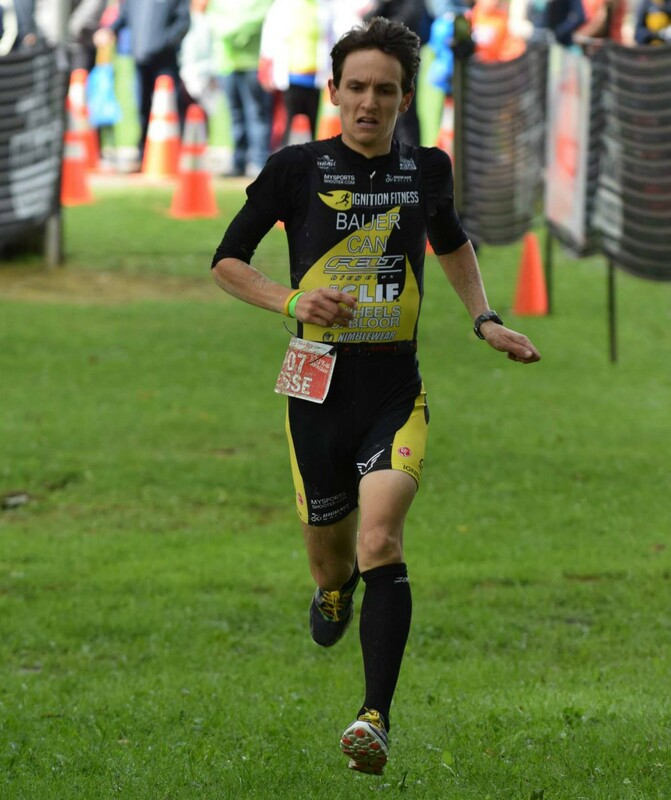 Racing Saturday was a ton of fun, a throwback to my cross country days, and left me free to mingle and meet the duathletes I write about every week on the Sunday. Still undefeated in MSC events this year, mud and all. Originally, I was slated to compete in the international distance event as my fall A race, but my struggles with recovery in the months following USAT Nationals in July left me a little bit short, physically and mentally, of where I wanted to be on September 14th. After tanking a couple of key longer workouts, we decided that it was best to have some fun with the sprint distance instead of suffering through a race that I did not feel ready for. The further upside was I got to be a spectator on Sunday, and live blogged the event for Multisport Canada and Duathlon Central. My bike was ready for the big one, complete with a new Aerojacket, but I was not. Switching to the sprint had some downsides, namely the weather. Racing on Saturday meant waking up to gloomy skies, chilly temperatures and driving rain, conditions that didn’t really let up until halfway through the race. Though it was chilly, Sunday was not as wet and even had a few brief moments of sunshine. Saturday’s rain also made a mess of the run course, giving the race a cross country vibe. Lakeside’s run course is on gravel access road, and it can get quite torn up in the rain. 2 solid weeks of rain made for sloppy running…my kind of fun! I had ambitious goals for this one, but the conditions made it tough going. The race itself was an enjoyable one, despite the difficult conditions. A solid field showed up, and I would face tough tests from Spencer Summerfield, Aaron Putman, Chris Marentette, and a few other strong athletes. I found myself right at the front joined by Chris and another younger fella (Joseph Hunter). I dispatched them heading downhill after the 1km mark, but soon after I was joined by a relay runner who pulled up beside me heading down the hill. We worked well together the rest of the run and I hit transition first of the duathletes in a time of 17:23. The bike course was slick and crowded, which had the effect of slowing down my bike time. 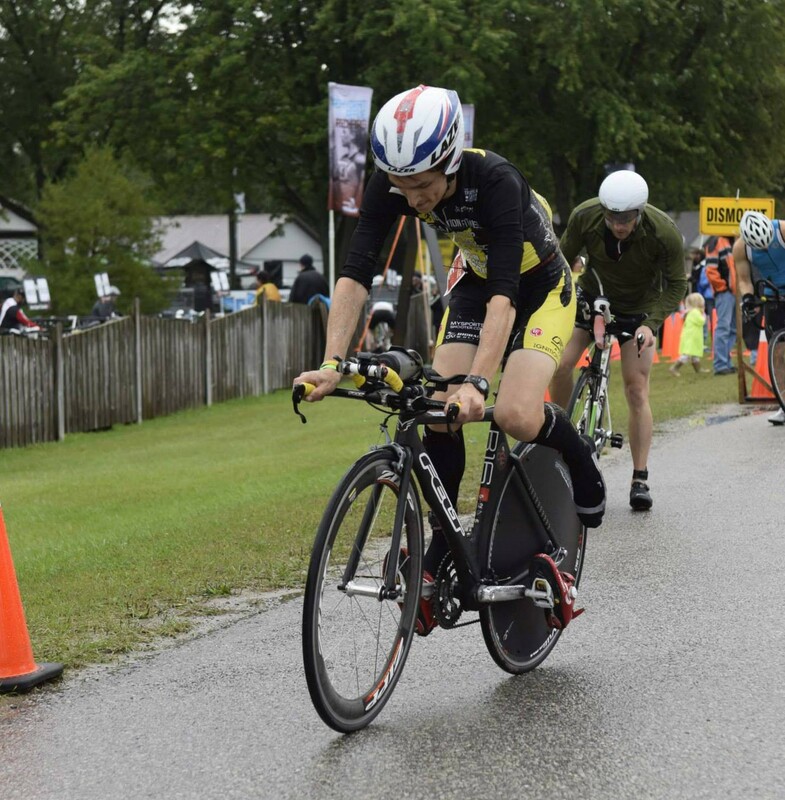 Many triathletes out on the course ahead of me seemed to be skittish about riding through the puddles on the road, creating the need to continuously spike my power to surge past groups of slower athletes. I also had the misfortune to get stuck behind a car…AGAIN. Maybe I can hope for some better luck with vehicles next year. 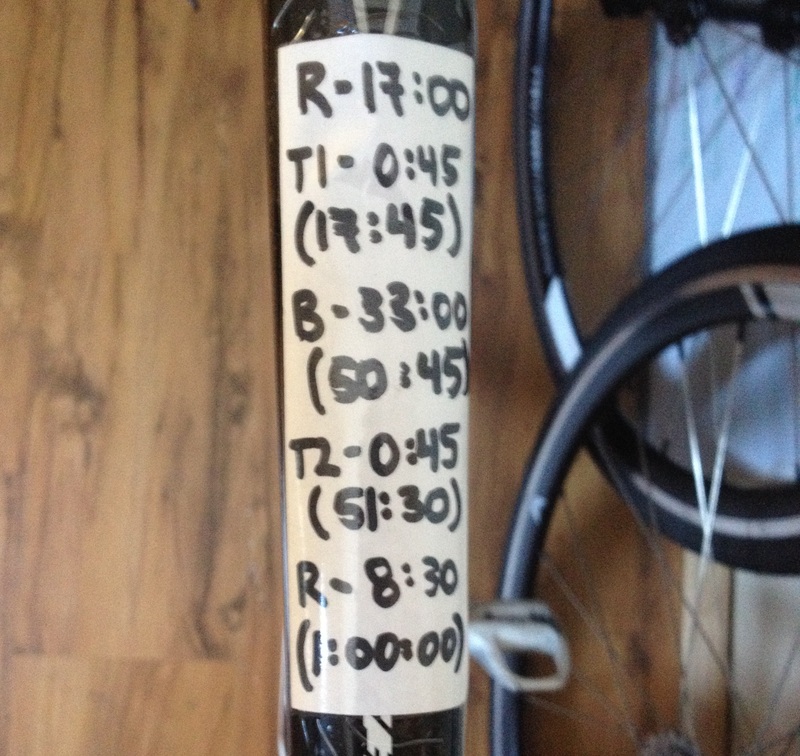 I missed my goal time for the bike by 1:17, coming in with a bike split of 34:17. Not ideal, but not bad by any stretch considering the conditions. The last 5km of the bike portion of the race was mainly spent looking over my shoulder for Spencer Summerfield, who I assumed would be charging hard. Fortunately, I think I was saved late by an ~1 mile long No Passing Zone at the 18.5km mark. At that point, I became confident that I would be first off the bike for the second time this season, which was indeed the case. Switching from using my Garmin on a quick release strap to a Timex on the run while keeping the Garmin on the bike led to my best transitions of the season. The great thing about the 5km run/20km bike/2.5km run sprint duathlon is the format. Unlike other duathlons, I find that a 2.5km final run can be fueled purely on adrenaline. Rather than holding back on the first run, you can treat the first run like an open 5km run then throw whatever is left into the bike, treating it like a 20km time trial, and still not cost yourself much time (if any) on the 2.5km run. I ended up slipping and sliding my way to a solid 9:07 split and my fourth win of the season, in a rain-soaked time of 1:01:46. 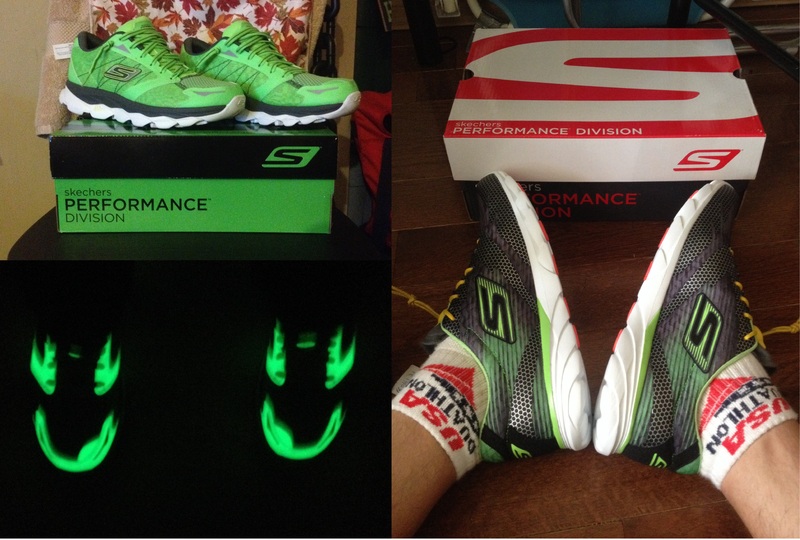 As a final race of the season treat, I was able to get my new Skechers GOMeb Speed 2 racing flats some action. It was a real treat was trying out a shoe brand that I have been following for several years. The shoes were light as a feather but still substantial enough to withstand the beating I put them through on the Lakeside course. I just received a second pair of Skechers, a pair of glow-in-the-dark Nite Owl Edition GORun Ultra’s, and I am very excited to log some training and racing miles on these shoes this winter. Look for a review right here in the coming weeks. My training shoes for what will hopefully be a solid winter of training. Some speedy GOMeb Speeds for racing and intervals, and Nite Owl GORun Ultras for the long stuff. In advance of a season recap post, I must give thanks to my girlfriend Emma for once again braving the cold, rain and wind to be there for me once again. To Coach Tommy Ferris with Ignition Fitness for being so accommodating to my constantly changing mind. 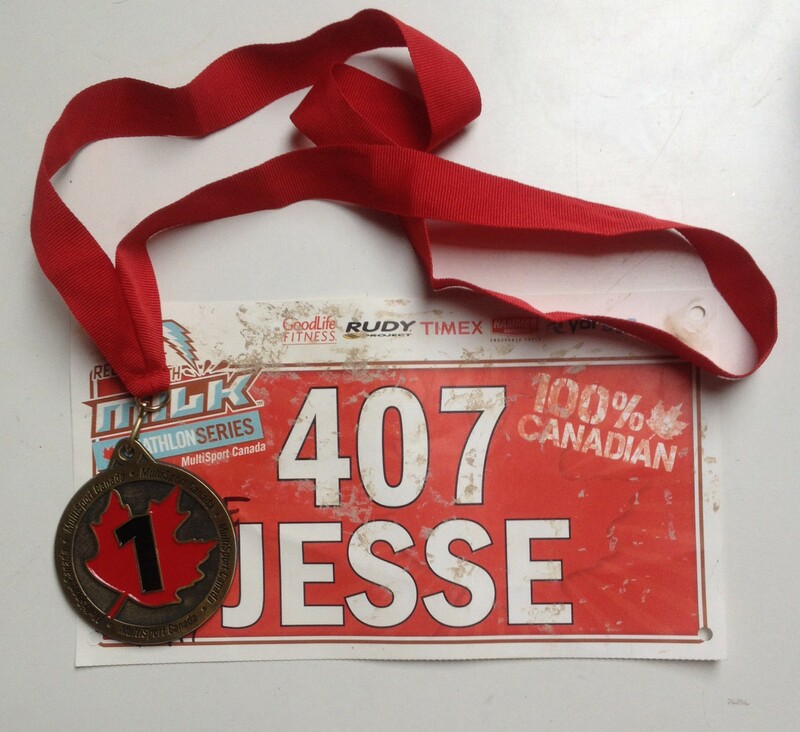 To Multisport Canada for giving me the opportunity and forum to learn and grow as a duathlete. And to Felt Bicycles, Clif Bar Canada, Nimblewear Canada, Wheels of Bloor, Big Race Wheels and My Sports Shooter for all of the support you give me and other Ignition Fitness athletes. Y’all are the best! Congratulations also go out to my friends and competitors who raced on Sunday, especially provincial champion Scott Finch. Given how hard this guy has worked to come back from some injuries, he definitely deserves to cap off his season on top. I am now taking a few weeks of much needed R&R. Season recap post to come. Until next time…keep Du’ing it!